A consistent pattern in our response to new technologies is we simultaneously overestimate the short-term impact and underestimate the long-term impact. - Roy Amara of the Institute for the Future. 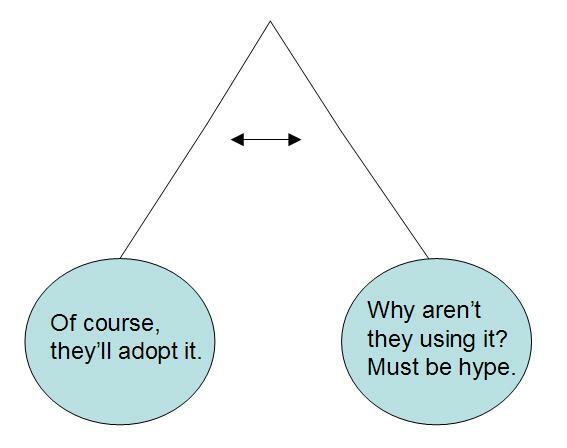 I have (and I believe that it's common) a natural tendency when looking at new technologies to swing back-and-forth between believing they are the best thing since sliced bread, trying something with the tool, running into barriers to adoption, feeling like they'll never get adopted. In response to my post Personal and Group Learning Using Web 2.0 and my post on eLearning 1.0, eLearning 1.3 and eLearning 2.0, I got asked about adoption. Will people really use this stuff? To add to the mix, there's some very interesting discussion going on out of an experiment by David Pollard where he offered to collaboratively edit a document on why collaboration tools are underused. In the responses (Shawn, Wendy) and in the result and in comments around all of this stuff, you can see a myriad of barriers to adoption of collaboration tools. The irony of collaboration around why collaboration tools are underused is undoubtedly not lost by everyone. It's first and foremost about personal value. Banking adoption on value to the department, value to the enterprise, value to the group, those are all hard sells. 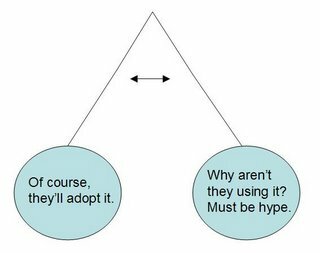 Thus, getting adoption of a new tool whose primary value is "collaboration" is a tough sell unless that collaboration has obvious, immediate value to the individual. Now, while my personal pendulum swings back-and-forth around adoption of approaches that I describe in Personal Learning for Learning Professionals - Using Web 2.0 Tools to Make Reading & Research More Effective and Personal and Group Learning Using Web 2.0 Tools, I actually think we are seeing tools that will slowly gain traction in the enterprise.